1. Place the potatoes in a pan of water, bring to the boil and simmer for 10–15 minutes until tender. Drain, mash and allow to cool before tipping into a large bowl. Mix the ham hock with the cooled potato, mustard and parsley. 2. Form the potato mixture into 8 cakes (approximately 100g each) and roll in the breadcrumbs to lightly coat. Place in the fridge for at least 30 minutes before cooking. 3. To make the hollandaise: place the large egg yolks in a small food processor or blender and whizz until incorporated. Heat the vinegar and lemon juice in a small pan until just stating to bubble then, in a steady stream, pour this onto the egg yolks with the motor running. Melt the butter in another small pan, skim off the foam and add the melted butter, in a steady slow stream, with the motor running. 4. Remove the potato cakes from the fridge, heat the oil in a large frying pan and fry the cakes for 3 minutes on each side until golden and crisp. Set aside to keep warm while you poach the eggs. 5. Bring a large saute pan of water to a boil then lower the heat until the water is barely moving. Crack in the eggs and poach for 4 minutes. 6. The hollandaise should now be thickened and glossy. Scrape down the sides with a spatula and pulse once more. Scrape into a bowl and keep warm. 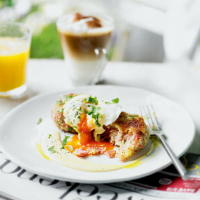 Place 2 potato cakes on each plate, top with a poached egg, spoon over the hollandaise and serve with freshly ground black pepper.